A new, revamped Challenge Mode is coming to dungeons in World of Warcraft: Legion, with multiple difficulty levels and some really nasty affixes. It’s something similar to Diablo III’s Greater Rifts. Right now players can run 5-man dungeons on Normal, Heroic and Mythic difficulties. These are all relatively easy once you have the gear and know the boss mechanics. And then, there are Challenge Modes where you can race a timer and get bronze, silver and gold medals as well as additional loot depending on how fast you complete the dungeon. This mode will get a complete revamp in Legion. The new challenge mode system is called Mythic+, and works like this in the latest alpha build: As players enter a 5-man Mythic dungeon, they can interact with a pedestal at the entrance and use a Challenger’s Keystone to activate Challenge Mode. Each keystone has a level, and the higher the Keystone’s level is, the more difficult the instance becomes. There’s a timer, and if players can complete the dungeon in time, they can keep and level up the Keystone. Higher levels also mean better loot, of course. Once players reach level 3, a random affix is applied to the dungeon, and oh boy, these sound brutal: “Raging” for example will enrage all non-boss enemies at low health, making them deal double damage. Another affix called “Tyrannical” will add more health and damage to bosses. “Skittish” is already my favorite: It simply decreases the threat tanks generate. 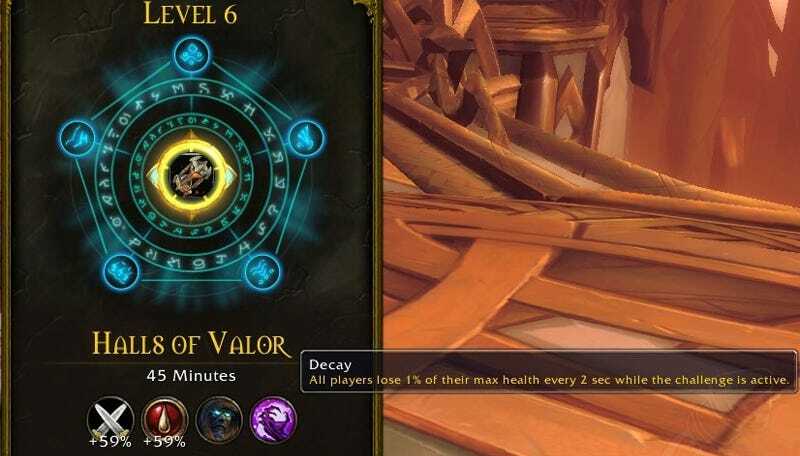 With “Decay” active, all players suffer damage over time while the challenge is active. There are quite a few of these affixes, and at higher levels, players have to deal with two or more of them at once, changing on a weekly basis. Sounds fun! It’s pretty similar to Greater Rifts and Rift Keystones in Diablo III, and how that system works. Warlords of Draenor’s dungeon system got a lot of criticism from players, who found it too easy and absolutely not rewarding. A new system, with an almost infinite difficulty scaling, will certainly spice things up.